I’ve written quite often how comics and cartoons are truly engaging and fully immersive mediums. 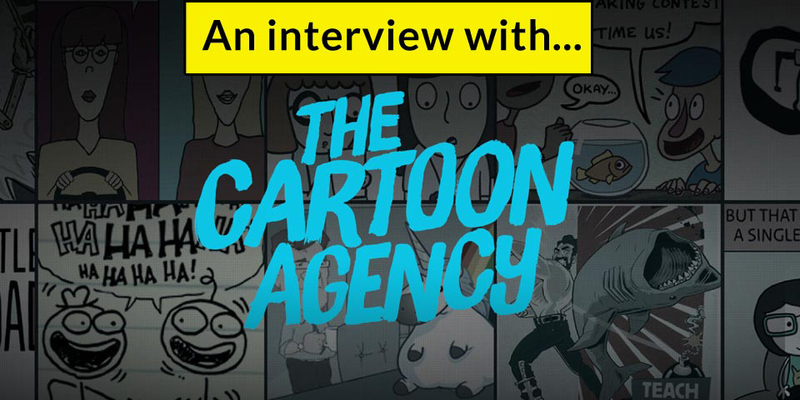 Steve Klinetobe, creative director and founder of The Cartoon Agency, describes comics and cartoons as a marketer’s dream. “Cartoons aren’t about laughs,” Steve explains. “They’re about insight, truth and relevance.” Steve gave me a chance to pick his brain on what makes our favourite medium and humour so effective. Tell us about yourself and how you came into focusing on cartoon marketing. It’s a story involving a 1979 Datsun 210, a bag of onions, a girl named Moon, and a well-worn pair of Levi’s 501 button-fly jeans. Actually, it involved none of those things but, you know, we gotta hook em’ in. The true story is a lot less interesting. For more than dozen years I ran a big hairy marketing agency in Portland, OR. We did great work. We had great people. We won awards. We tanked in 2010. It’s easy to blame the economy but I don’t think that’s the whole truth. Ultimately, I think we died because we offered too many services across too many mediums for too wide a spectrum of industries. In other words, we were generalists. Very few generalist agencies made it out of the recession unscathed. 1) It had to be something I actually cared about. 2) It had to be something that stood out in the marketplace. 3) It had to be fun. Aside from their visual appeal, where do you see cartoons fitting in today’s digital marketing strategy and landscape? Cartoons aren’t about laughs. They’re about insight, truth and relevance. Take Calvin & Hobbes, for example. What makes it so brilliant, so loved, is how incredibly honest it is. We see ourselves in the characters. Isn’t that a marketer’s dream? A story so rich with character and emotion that the audience actually feels they are part of the narrative. I don’t see another type of content that can come even close to delivering on that promise. The Cartoon Agency blog posts a lot of vintage advertisements which used cartoons. Do you feel that cartoons may always have their appeal in advertising and marketing strategy? I was impressed by how effectively The Cartoon Agency used humour in the content piece you created for Check One Two explaining the importance of and step-by-step process of self-examinations for testicular cancer. Do you have any advice for marketers and strategists on how serious topics can be approached with humour? Comedy is hard, humor is easy. Why? Comedy is so subjective and reliant on timing. Humor, though, is natural and emotive. If we approach it through a marketer’s lens we understand that every topic, every audience has an emotive link. Especially the tough subjects. And wherever there is emotion, humor has a role to play. Brands tends to shy away from humor because they confuse it with comedy. Comedy can backfire. Comedy can get people fired. But humor, respectful, light, smart, inspirational, can safely lift a brand. It can build trust and spark actual conversation. The Check One Two Campaign was battling decades of quiet, awkward lectures from school nurses about testicular cancer. The topic was always addressed in the most sterile way possible. Check One Two approached it differently, less clinical and more real. They wanted to use the language and humor of the group they were targeting: young dudes. Normally brands are so worried about their polish that they forget the people they’re trying to reach are actually 100% human beings. What pieces of advice would you give brands who may be looking to incorporate cartoons in their marketing for the first time? Be patient. So many times I’ve had potential clients ask to run a “test” of 1 or 2 comics. I’ve started saying no to this. Why? Because no single cartoon is going to significantly outperform the other content-types in your channel. Cartoon storytelling takes time. You want your audience to fall in love with the characters. You want them to look forward to the next episode. The audience will grow organically, then exponentially. It’s kind of cool. To me, the greatest success an episodic cartoon can achieve is when a fan prints it out and sticks it to her cube wall. Huge. Thanks Steve! Check out Steve’s agency and their work at cartoonagency.com.